Looking for some downloads for LCS? Get them right here! Video tutorial for installing Cheat Device. This does not work on FW 2.7 & up! Update: You can not just rename the map, this will make the savegame corrupt. I'm very sorry if I caused any damage. 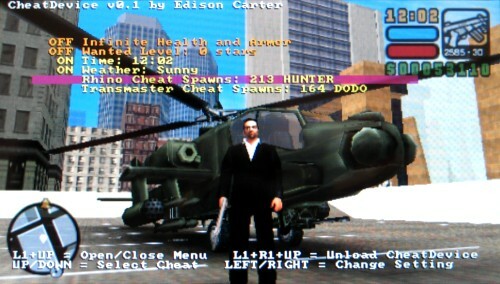 The GTA guru Edison Carter has made an awesome program that lets you do some pretty cool cheats. It's just an edited savegame. This does not work on FW 2.7 & up! This little program allows you to quickly use a cheat, either one you made or from someone else! To register or if you want to learn more about it go to the CheatSync site.